The team in the Black, White and Blue: the Belconnen United Sharks JRLFC commence their 32nd year in the local league competition in 2019. While they may not be the biggest club in the comp, they are well-known as the family club. They have families who have been with them for many years, but more importantly, the club feels like a family. They’ve got committed volunteers from all teams involved in the planning and running of the club and, for the duration of the winter months, all become part of the Sharkies family. During the year they hold a Club Training Night, an evening co-hosted by the Belconnen United Sharks Seniors, where kids from 6-15 are placed into mixed age groups so that they might learn new skills, train with more knowledgeable club mates, have a laugh with agility tests and size themselves up with the tackling bags. As a sponsor for the Sharks, the RUC is the preferred home game hospitality venue for the club for the last two years and has been co-hosting their yearly Anzac Day Two-up game. We also run an annual Trivia Night with the Sharks and consider them a valued partner in our community. If you have any enquiries for the club, be it a child interested in playing rugby league, or if you would like to get involved as a coach or volunteer, get in touch by emailing belconennunitedsharks@gmail.com or by finding them on Facebook. It’s hard to believe it, but we are just over a month away from the start of the 2019 NRL season – it’s footy time! 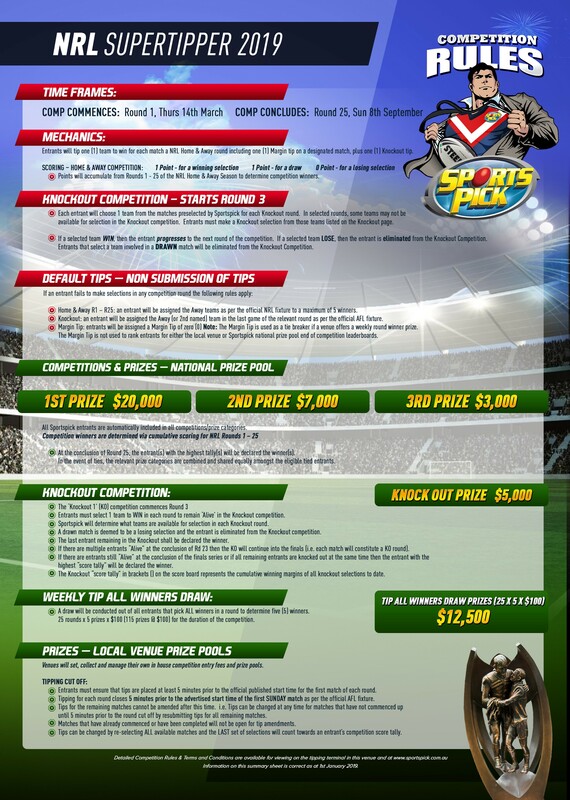 We’re proud to announce this year’s new Sports Pick RUC NRL tipping comp which kicks off in NRL Round 1, Thursday 14th March, and runs right through until Round 25 on Sunday 8th September. The bonus? You can win big this season! For your entry fee of $50 per person, you can win the NRL RUC local prize pool minimum of $1200 for first place. Not to mention the National prize pool of over $35,000. Once you are registered, you will receive your own Sports Pick card. Then all you need to do is tip one team to win for each match in an NRL Home and Away round including one margin tip on a designated match, plus one knockout tip. All tips need to be made at the club with the exception of three online tips per year. The competition is open to all members of the RUC, with a maximum of one entry permitted for each registered participant. A complimentary food and beverage package for Stage of Origin II and a presentation night. Cash prizes to top place getters.